Whenever I get the rare opportunity to lay on the couch and watch whatever I want (i.e: when the roommates are out) I usually try to indulge myself with something moving or somewhat educational. That usually leads me to netflix’s extensive (haha) array of documentaries. 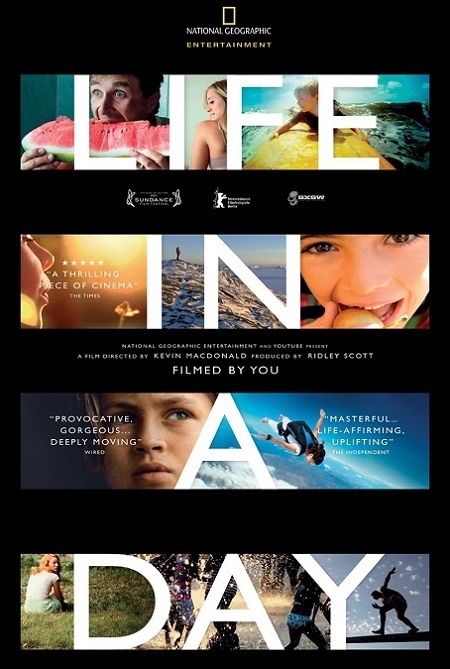 I have always seen Life In A Day in the documentary list but always tended to look past it and move on to stuff seemingly more interesting (Exit Through the Gift Shop – a documentary about street art and in particular the ever evasive Banksy, highly recommended and quite cool). But since I have already watched all of the sports documentaries that seem interesting and couldn’t find anything on the tube to watch I decided to give it a try. From the first scene I was torn between changing the movie and staring blankly at the screen, but something about the homemade footage and the constantly changing storyline kept me ever increasingly attentive. The documentary was a project by national geographic and youtube and spanned thousands of people filming several thousands of hours of footage on July 24th, 2010. The movie depicts an extraordinary variety of people and cultures, all sharing similar stories though out this Saturday in July. The most touching part of the movie is seeing first hand the everyday struggles and heartache, happiness and delight felt by everyone all over the world. The movie asked three questions: what is in your pocket, what do you love, and what do you fear. Each of these questions presented hundreds of answers from a variety of people, yet each of them told similar stories. We are all human and the struggles and rewards we get from life are all quite similar, even though the magnitudes of each can be varying. That’s all I can think of now, I will update this when my mind is not falling asleep. Endowed with a wealth of knowledge on every topic, but only a little bit of knowledge about each topic. A lot of people are really good at one thing, I was graced to be okay at just about anything. Need a light bulb changed on the door of your car - I can barely do that, looking for advice on how to run a program in Linux? I can probably squeeze something out. I've always joked with my best friend Ryan that we should write a book called "Pretty Good At Everything" I think that basically sums up my life. I've competitively swam my whole life and I love the water and anything to do with it. I now am an assistant coach at my alma mater Lake Forest College in upstate Illinois. Have a question about anything in life? Shoot me an email! m_mackin@yahoo.com Cheers!